As you know, I love PowerShell! I use it all the time in my daily job as a SQL DBA and at home whilst learning as well. Not only do I use PowerShell for automating tasks such as Daily Backup Checks, Drive Space Checks, Service Running Checks, File Space Checks, Failed Agent Job Checks, SQL Error Log Checks, DBCC Checks and more but also for those questions which come up daily and interfere with concentrating on a complex or time consuming task. I am going to write a short post about each one over the next few weeks as I write my presentation on the same subject which I will be presenting to SQL User Groups. Todays question which I often get asked is Which roles is this user a member of? Obviously it is not normally asked exactly like that but for a DBA that is the question. Following good practice we try to ensure that database permissions are granted by role membership and each role is creatd with the minimum amount of permissions required for successful execution of the task involved. So I only concentrate on Role Membership for this script. The script in the next post will deal with Object permissions. This question can come from Support Desks when they are investigating a users issue, Developers when they are testing an application as well as audit activities. Write-Output "Logins for `n $logins displayed below"
Write-Output "`n $server , $login "
Write-Output " $login is a member of $Role on $Server"
Write-Output "`n $server , $database , $login "
Write-Output " $login is a member of $Role Role on $Database on $Server"
Write-Output "Finished - If there are no logins displayed above then no logins were found!" This entry was posted in PowerShell, Powershell Box of Tricks, SQL Server and tagged automate, Box of Tricks, Permissions, Powershell, Roles, SQL Server. Bookmark the permalink. Reblogged this on SQL DBA with A Beard. 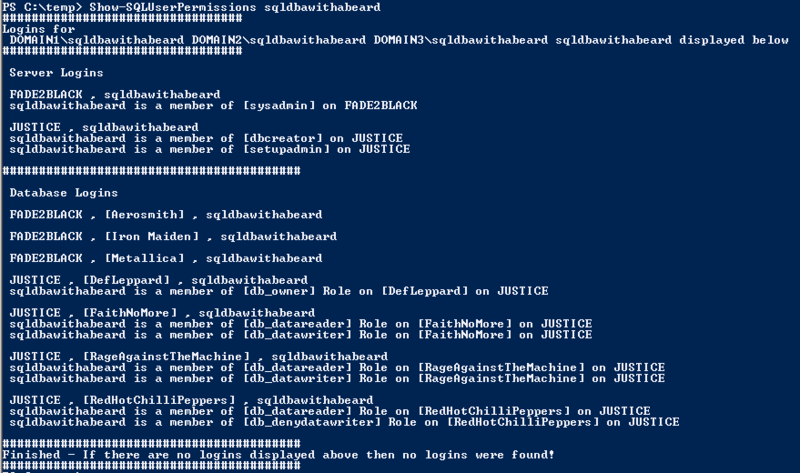 Great post, helped me on the way to sorting my issue with creating logins\users through PowerShell as part of an automated deployment! How should we order by CreateDate, DateLastModified for last 7 days?